I don’t know much about you. I do know four things. 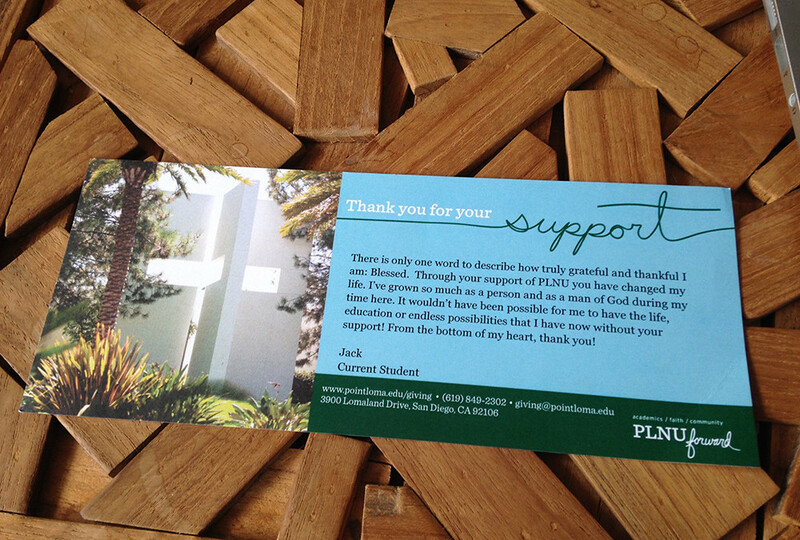 You are a student attending PLNU. You are a part of a team that thanks people for contributing to a scholarship fund. I received a thank you note from you. Each month we get a thank you note from your school and every time I feel grateful to be able to participate. The difference between the notes before and this one? It was written by you. And, you’re a guy. It shouldn’t make a difference. Because it’s rare to see. A personal note coming from a guy willing to serve. Thank you for reminding us that it isn’t a rarity unless we make it one. When I ask kids in my youth group to get involved serving others, missions, compassionate work, outreach, or simple acts of kindness like writing a thank you note, the gap shows. 70/30 I’d have seven girls for every three guys. This isn’t sociological research but it seemed to be my general experience. But why? Do I believe that females should have greater access to math and science and fields where males typically are more encouraged? Yes. But I equally agree that men should also have access to humanities, to serving, to compassion. I wondered if my experience was based more on what I expected from people than on actual facts. I changed my approach and started looking for how differences could change our ministry landscape. Every person, regardless of gender, is reflecting a part of God’s image and nature that no one else can. Recruiting you means wanting to discover where you’ll serve best based on the way God has wired you. Your thank you note was a reminder of an actual fact, Jack. That you are made in the image of God and you’re wired to serve, like only you can. You were born to serve. You are wired with a voice, to be compassionate, to give thanks, and offer your life-gifts-skills-knowledge-passion-joy-humor-grit-strength-and ideas just as much as any other person. The fund you were thanking me for contributing to, well, I also thought of the guys who we sometimes overlook in a crisis that isn’t easy to talk about. The Beauty for Ashes fund will help PLNU scholarship and support human trafficking survivors. It’s a way to share an education, a loving mentoring community, a safe place, and opportunities for the future. I want to invest in that future. Not only in Southern California, maybe someday in Lakeland too. …when the “he’s” are hurting and harassed just as much as the “she’s” are. Even though you’ve not been a recipient of this fund Jack, your note reminded me that there will be guys who need it too. You may not have thought much about the little thank you wrote to encourage givers. But it reminded me of some important things. The note you write matters. The one’s who don’t think they matter matter. Having the mind of Christ to give people a chance matters. Letting go of stereotypes matters. Thank you Jack for saying a lot more than I think you wanted to say. I appreciate you being you. A student and someone who had a few extra minutes to say “thanks”.